SuperFogeys - 240 – ZAP! For those wondering, Captain Spectacular is thinking back to something that happened way back in Chapter 5. Click here to see it in its entirety, and click here to see him discuss it. If you follow me on Twitter, then you know that I had planned on coming back from my vacation with a quintuple-sized strip. That was crazy talk. Believe it or not, I do have a life and, much as I wanted to, I just couldn’t do an update of that size in the time that I had. So, I split it up and you’re getting the second half of that mondo-sized strip today. However, I thought some of might be interested to see what could have been. The writing of Quintuple-Sized Strip That Was Not Meant to Be was, for some reason, quite laborious. As per usual, I typed out a quick script based on the outline I’d written for myself some months ago. But this time, once it was time to start drawing, I realized that it wasn’t quite up to snuff and that there were some big ideas and callbacks that weren’t getting the proper time. So, I began rewriting. Now, dialogue is my favorite thing to write. There’s nothing more fun for me to write than two people talking, and this was my one chance to have the Third Man and Captain Spectacular really go at it. I wrote what I thought was a pretty good exchange between them, and then did my best to segue from that to Third Man making his move on Tom. Sounded pretty good. I’d even go so far as to say that the dialogue for CS and TM was some of my most favorite. And it was 23 panels! Woo-hoo! Only, not woo-hoo. See, when I looked at what I had planned as a whole, I saw that my “funny” exchange (it was now getting less funny) just didn’t fit at all. This was a serious moment, something I’d been building up to since at least Chapter 5, and I what was I doing instead? Spending way too much time on this comedy routine. So, I went back to the script and just cut the whole thing out. This was a hard thing to do and I really wrestled with it. I liked the exchange. But…it wasn’t servicing anything, so out it went. Now I had a much tighter story and more consistent tone…and no time to draw it all. That’s when I decided to split it. So, I drew the first part, which you can see here. It was then that I quickly realized that by splitting up the Quintuple-Sized Strip That Was Not Meant to Be I was doing a part one with no weight to it. It just sort of…ended. So, I had to come up with something–some kind of payoff to the experience of reading part one. After a couple of drafts I felt like I got it right and off I went. Below you will see the two documents that trace this creation process, though I don’t expect you to be able to follow it at all. First, is the script. The typed portions are the original, early script. Around that you will find the various alternative lines and tangents that I went on before hitting on what finally made it to your screen. Included in that is the original banter between Captain Spectacular and the Third Man. 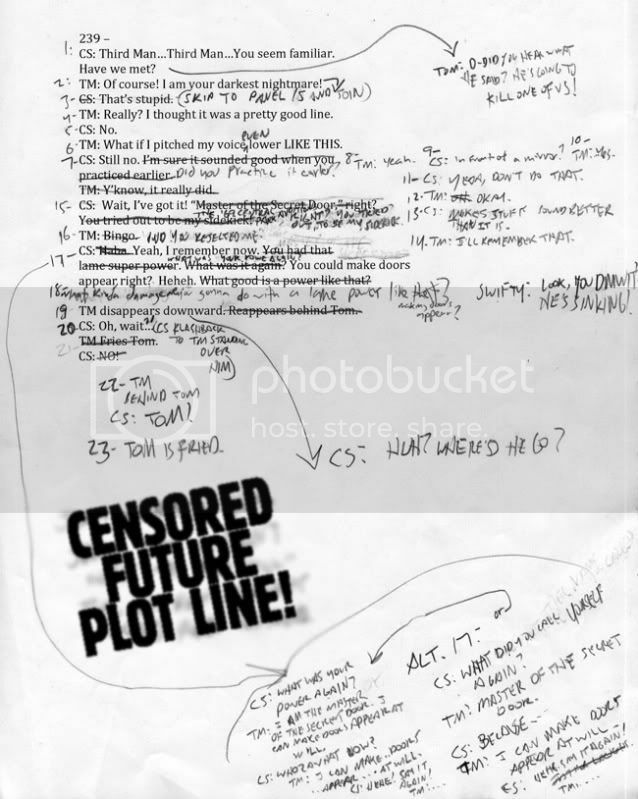 In the middle of the page you’ll notice a censored section. Sorry. That’s future business. Can’t let you see it. I make notes like that whenever I’m setting up something that pays off later. I always like to know what the answers are to the questions I’m raising and writing them down helps me to remember, even if I throw the paper away later. Below that are the two versions of the last panel of page one that I came up with. See if you agree with the one I chose. Pretty obvious why I don’t hand letter, isn’t it? 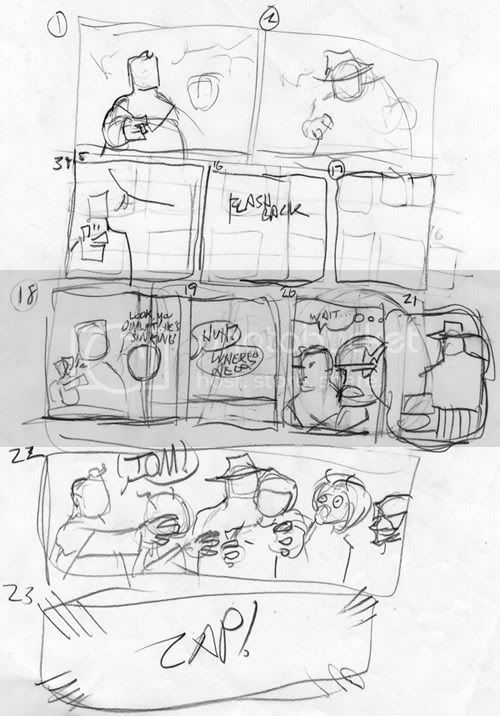 And now here’s the original layout for the Quintuple-Sized Strip That Was Not Meant to Be. This is something I worked on while I was writing the script, so you’ll see some of the remnants of the original 23-panel version that I abandoned in the erasings. I’m a terribly hard penciller. Notice that Captain Spectacular has the same pose in three of the panels, all of them lined up vertically down the left side. Didn’t notice that until I started drawing the full pencils, so I had to correct it in the final version. Hope some of you enjoyed this peek behind the scenes. I’ve been asked before what my writing process is, and I think this is a pretty fair example of what I go through on any given strip. On Tuesday, “Six Wives” continues as we see the fall of Captain Spectacular’s marriage with Star Maiden. Then, on Thursday….um, it’s not lookin’ too good for Tom, is it?